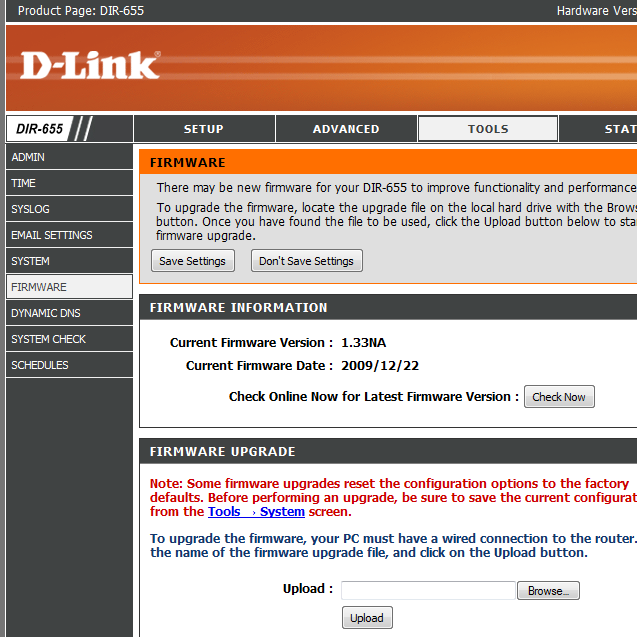 D-Link has released the 1.34b03 Beta firmware for the DIR-655 router. The first fix was available in the previous firmware 1.34b02, I have found it stops connections that people have noticed the router give to the Bsecure servers when SecureSpot is not running. The second fix addresses a bug that appeared in that firmware causing the statistics page to report ridiculously high stats. Using this firmware is at your own risk and will most likely void your warranty if something goes wrong. PS: you could add to tag linux too, since i mostly use linux to configure/update the router and have had no issues arrising from this fact. Thanks Toto, I’ve added Linux to the tags so people should be able to find the page if they do a search. Is this version also suitable for an A4, 1.31EU – version? I believe it should support the A4 version, however there is a newer version out, 1.35, which you can get at ftp://ftp.dlink.com/Gateway/dir655/Firmware/dir655_FW_135NA.zip. However as you are running EU firmware you may want to hold off upgrading to the US firmware as different countries have different wireless requirements and channels available, http://en.wikipedia.org/wiki/List_of_WLAN_channels for example shows that the US does not have channels 12 and 13. Keeping that in mind you may not be able to downgrade back to the EU firmware, however https://www.techgremlin.com/2010/01/31/downgrade-d-link-dir-655-1-3x-firmware/ was and may still be one method of downgrading.